Q: Does Zipit Bedding charge sales tax? A: Sales tax will only be applied to orders from California. Q: Does Zipit Bedding come in different styles? A: Yes, we actually have 9 cool and fun styles! 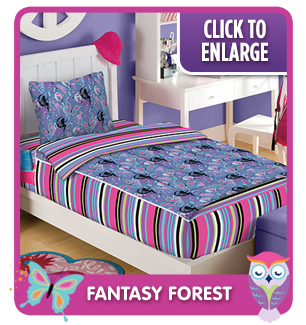 There are six Themed Prints: Extreme Sports, Rocker Princess, Outer Space, Fantasy Forest, Wild Animals and Sweet Dreams. 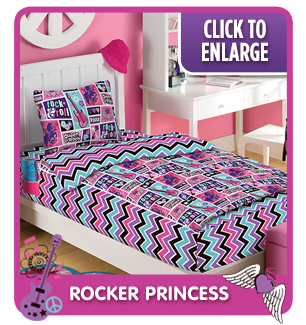 There are three Generic Prints: Pink Clovers, Navy Stripes and Gray Stripes. Each Themed set glows in the dark and is reversible. Each Generic set does not glow but is also reversible. Q: How does Zipit Bedding work? 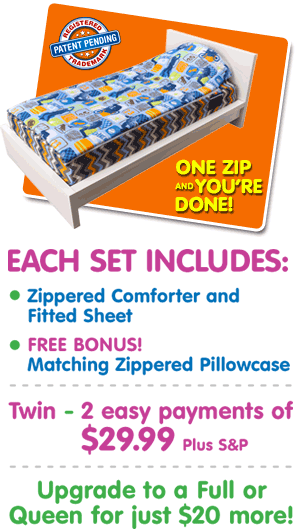 A: Zipit Bedding works just like a sleeping bag, so suddenly making your bed becomes FUN, FAST & EASY... you just Zipit! Plus it makes changing your bedding a breeze! No more struggling with bulky sheets and blankets, with Zipit Bedding it's easy... you just Strip, Wash and Fit all as One! You can also unzip and detach to wash the piece of your choice! Zipit bedding also comes with built-in zippered side pockets, so now it's easy to store your important belongings that can go missing during the night, like cell phones, diaries, retainers, flashlights, jewelry and more! Zipit Bedding is made with super soft / durable material and high quality zippers, so it's made to last. Q: How long does it take to receive my Zipit Bedding order? A: Your Zipit Bedding set will ship within 30 days from the time the order is processed and will be mailed via FedEx Smart Post. Please allow 2-3 for processing and handling. Feel free to track your order on our site! Q: What if I am not satisfied with my Zipit Bedding order? A: Our main goal at Zipit Bedding is 100% customer satisfaction. Which is why we offer a 30-Day Money back guarantee! Just reach out to our customer service team, who are waiting to take your call at (844) 281-1529 or send us an email at zipitcs@worldpackusa.com and we'll get you taken care of. Q: What sizes do you offer Zipit Bedding in? 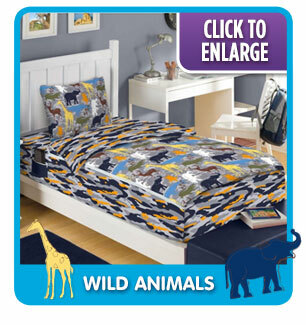 A: Zipit Bedding Themed prints are offered in Twin and Full. 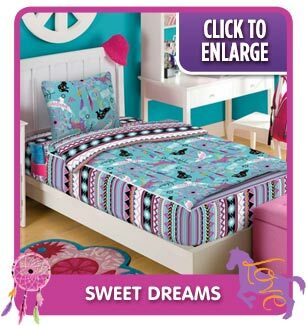 Zipit Bedding Generic prints are offered in Twin and Queen. Queen is 59” X 79”. These sizes all fit standard US Twin, Full and Queen size mattresses and airbeds. Q: Will Zipit Bedding fit on my RV bed and/or my Murphy bed? A: Zipit Bedding is perfect for RV and Murphy beds! However, as all RV and Murphy beds can differ slightly in size, we suggest you make sure to measure your mattress prior to placing your order. If it measures the same or within 1” of our sizes, it should most likely fit! 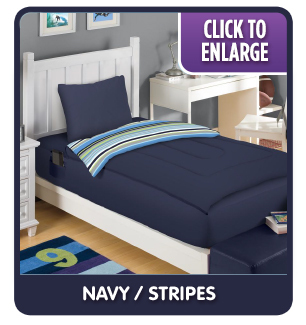 Q: What ages do you recommend Zipit Bedding for? A: The current Themed line was designed for kids between the ages of 4-13 years of age. However, anyone who owns a Twin or Full sized bed can use it! And Generic prints are for all ages. Q: Is Zipit Bedding hypoallergenic? A: Yes! Zipit bedding is made of 100% micro-fiber polyester and the fill is a 100% synthetic polyester fill, which makes Zipit Bedding hypoallergenic (as opposed to a non-micro polyester and a non-synthetic fill, such as down). Q: Is Zipit Bedding organic? A: The materials consist of 100% micro-polyester which is not organic. 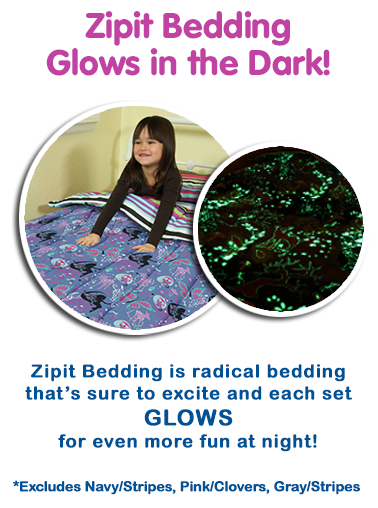 Q: The glow-in-the-dark side of my Zipit Bedding seems to be fading after I washed it. What do you recommend I do? A: Oh no, we're sorry to hear that! Depending on how many times you have washed your Zipit bedding set, it should maintain its ability to glow for up to at least 5-7 washes. 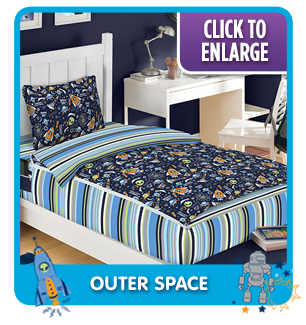 Also, we suggest you wash your Glow-in-the-dark Zipit Bedding sets in COLD water only. You can use any cellphone flashlight to re-charge it, too. Just hold the flashlight over your Zipit Bedding comforter for about a minute and it should be glowing again! 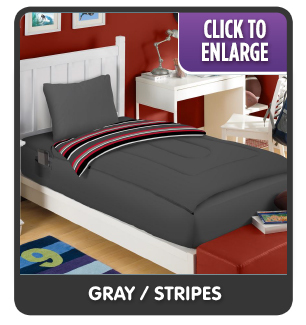 Q: Does Zipit Bedding offer a matching bed skirt? A: At present, we are not selling coordinating bed skirts. 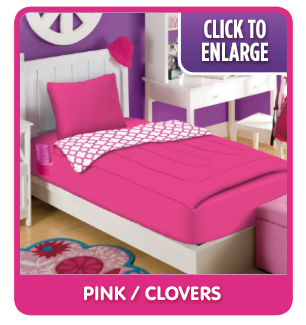 If you desire a bed skirt, we do recommend that you purchase a solid coordinating color, such as pink or navy, which should coordinate with the colors in any Zipit Bedding set. Q: Are the zippers in Zipit Bedding a potential choking hazard for my child? A: Zipit bedding sets meet all required United States inspections for safety and are made with highest quality UCAN brand zippers that pass the strict ISO 9001:2008 certification guidelines. Our zippers are also 100% lead-free. Q: My Zipit Bedding zipper broke, what can be done? A: Aw, we're so sorry to hear that! Though we pride ourselves on our quality, occasionally a zipper can break. Which is why we offer you a 30-Day Money Back Guarantee, giving you the option of either returning your Zipit Bedding for a refund (Less S/P&H & WSF) or exchanging it for a new one. Please refer to our Return & Exchange Policy, located on our site, for more details. Q: Is the bedding flame resistant? A: Yes, Zipit Bedding is flame resistant and the zippers are lead free. Q: Do you sell Zipit Bedding pillowcases or comforters separately? 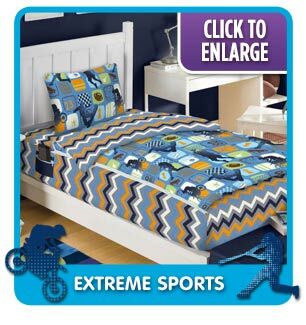 A: At this time we do not sell pieces of the Zipit Bedding set separately. However we hope to do so in the near future and will keep you posted! Q: Do you ship Zipit Bedding sets to Canada? A: Yes, we ship to Canada. Please confirm the dimensions of your bed will fit with ours before you place your order. Q: Will I receive an email confirming my Zipit Bedding order? A: Yes, you will receive an email thanking you for your order and a second follow-up email to let you know your Zipit Bedding has been shipped. Q: Where is Zipit Bedding manufactured? A: Zipit Bedding is created in America and manufactured in china.